« Is Warren Buffett’s Support for Higher Taxes a Way of Paying Back Politicians for Big-Government Policies that Line His Pockets? I’m getting very frustrated. I spend too much time reminding my supposed allies that America’s fiscal problem is too much government. Deficits and debt, I constantly explain, are best understood as symptoms, whereas a bloated public sector is the underlying disease. Even people who are very solid on fiscal policy make the mistake of sometimes focusing too much on red ink rather than the size of government, including Senator Jim DeMint, Mark Steyn of National Review, Representative Paul Ryan, and my old friends at the Heritage Foundation. So I’ve decided to create a new award. But unlike my other awards, which are exercises in narcissism (Mitchell’s Law, Mitchell’s Golden Rule), I’m naming this award after former Senator Bob Dole. The message is very simple. Whenever people complain about red ink, even if they are genuine advocates of small government, they give leftists an opportunity to say that higher taxes are a solution. That’s bad politics and bad policy. And since Bob Dole excelled in both those ways, you can understand why his name is linked to the award. 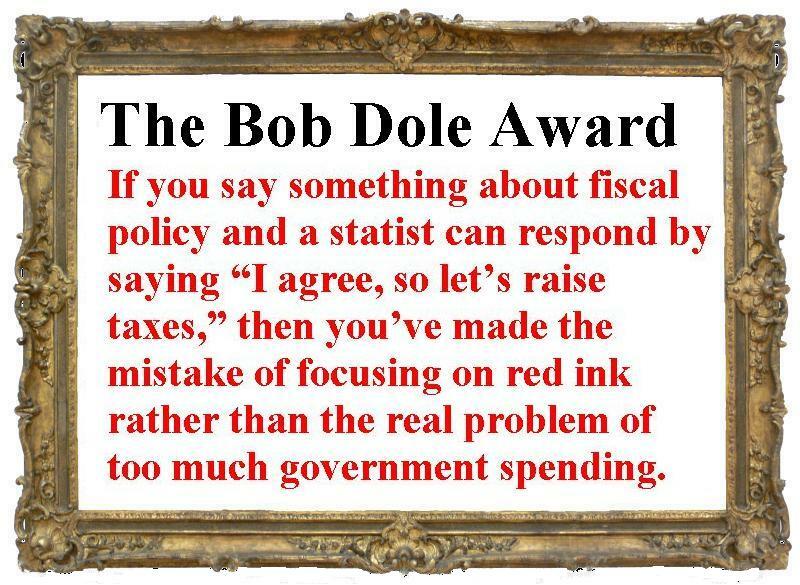 Naming the award after Bob Dole also is appropriate since he was never a sincere advocate of limited government. The Kansas lawmaker was a career politician who said in his farewell speech that his three greatest achievements were a) creating the food stamp program, b) increasing payroll taxes, and c) imposing the Americans with Disabilities Act (no wonder I wanted Clinton to win in 1996). For all of these reasons, and more, no real conservative should want to win an award linked to Bob Dole. So I’m putting the policy world on notice. If you say the wrong thing – even if your heart is in the right place, you may win this booby prize. This video has further information on why the real fiscal problem is excessive government spending. Deficits also are bad, the video explains, but they are best understood as a bad consequence of big government (with high taxes being the other bad consequence). One last point, for those who are still fixated on red ink, is that nations that do the right thing on spending also tend to be the ones who reduce deficits and debt. Not that this should come as a surprise. The best way to get rid of symptoms is to cure the disease that causes them. on February 5, 2014 at 7:10 pm What is the import of the farm bill to Kansas?